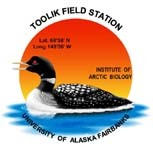 » Aboveground plant and belowground stem biomass were measured in moist acidic and moist non-acidic tussock tundra experimental plots, Toolik Field Station, Alaska, Arctic LTER 2000. Plots at the acidic site (MAT) were set up in July 1996 on extra 5 x 20 meters plots within the four block design of the 1989 LTER acidic tussock experimental plots. On each plot a 5x10 meter section was fenced with large mesh (4-inch square mesh) and within this fence a 5x5-meter plot was fenced with a small mesh (1/2-inch square mesh). In each block two fenced plots were setup: a plot with no fertilizer and a plot with annual fertilization (NP) treatments of 10 g/m2 Nitrogen (as NH4NO3) and 5 g/m2 Phosphorous (as triple superphosphate). In this biomass harvest only the control unfenced (NFCT) and NP unfenced (NFNP) treatments were sampled. Plots at the non-acidic site (MNT) were setup in July 1997. Three replicate blocks were established with the following annual treatments in 5 x 20 m plots: control (CT), nitrogen added (N), phosphorus added (P) and N and P (NP) in the same amounts as described for the MAT site. Two replicate blocks were established with a greenhouse treatment (GH) and a greenhouse fertilized treatment (GHNP). Greenhouses are annually set up in late May or early June and removed in the end of August or early September. Notes: Cassiope tetragona was not separated into leaves and stems prior to drying and weighing; “new stems” includes new leaves and “old stems” includes old leaves. Version 4: Added LTERNET Data Access server proxy for Excel and comma delimited data files. Version 5: Update LTERNET Data Access server proxy link for Excel and comma delimited data files. Changed from knb to das in url. Version 7: Added notes about "lumped species" to new "Species Comments" column. Taxonomic coverage data updated. Updated metadata to newer form (with sites sheet). CH March 2013. Version 8: Corrected errors in biomass categories - some below stems were listed as new above. Changed site names, treatments, species and growth forms so they match the master list of all biomass. Definition: Date of beginning of harvest. Harvests usually last 4-5 days. Definition: The species sampled or a lumped group. See ?Notes on lumped species? under this variable for notes on species grouped together. ?Seedlings? indicates the number and identity of seedlings found in that quadrat. ?Comments? includes additional information about the quadrat. Definition: Notes on lumped species categories. Definition: Comments about individual samples.